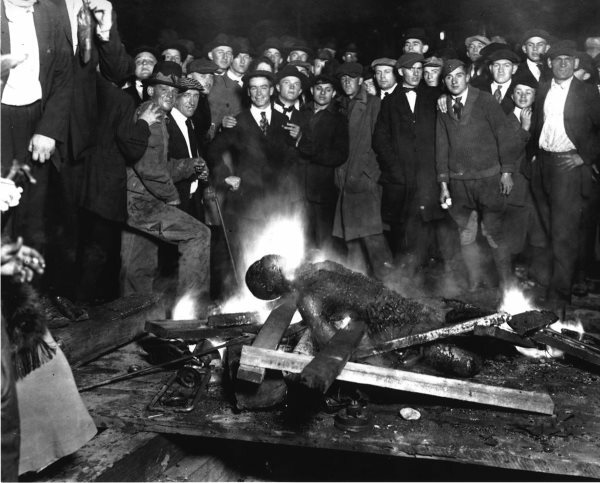 Omaha court house lynching (burning to death) of a Black man who a white mob claims looked at a white woman. In attendance, thousands of white Americans. AFRICANGLOBE – The so-called war on drugs in America, which we now know is a war on Blacks – Michelle Alexander would call it, the New Jim Crow – perhaps to curb a growing African American population, or perhaps to conserve the lasting paradigm of white supremacist ideology has rampaged Black lives and African American communities for more than five decades and counting. Mass Incarceration and its concomitant Police Brutality, like Slavery, Lynching and Jim Crow before them, all speak to the existence of a problem never addressed in western media – White Terrorism. The idea of White Terrorism is not new and it is not limited to America. But it is not at all confined to people who call themselves Caucasian, nor is it practiced by all Caucasians. There are Caucasians who do not ascribe to white supremacy – they do not think they are better than other human beings who do not look like them. Much like there are Muslims, a significant number of Muslims, who do not see eye to eye with Islamic Terrorism. And still much like Christians in our immediate past, who did not all agree with other Christians who believed that Slavery was ordained by God and that lynching Black people was a moral practice to preserve God’s Kingdom here on earth. But the idea of White Terrorism exists alright. It is the kind of terrorism that has maintained white privilege by and large in the United States for more than four centuries. The plague of White Terrorism running down American streets has been called many names at different times – Slavery, Segregation, Jim Crow and the War on Drugs/Blacks. It is important to understand the geopolitical and the georeligious underpinnings of White Terrorism. To do that we have to remember that the hangings, burnings and dismemberments of African American men, women and children that were relatively common in America way before the Civil War and until World War II were often public events. The Equal Justice Initiative, took a step in that direction when it released a report that chronicles over 4,000 official lynchings of Black people in 12 Southern states within a period of 73 years. The report could not confirm 1000s of other lynchings chronicled by African American writers during slavery, mainly because white slave owners would not report them or denied them. However the official lynchings documented by African American newspapers between 1877 – 1950 were sometimes advertised in white newspapers, letters and judiciary proceedings and drew hundreds and even several thousands of white spectators, including elected officials and leading citizens who were so swept up in the carnivals of killing Black people that they posed with their children for keepsake photographs within arm’s length of mutilated Black corpses. Lynching should therefore be described in its complete context – as White Terrorism – a legacy of slavery, civil war, reconstruction, and the pervasive racism and mass incarceration of African Americans today. A majority of whites for more than three centuries prior and for arguably most of the 20th century somehow were made to believe that Blacks were inferior, perhaps not comparable human beings to whites. 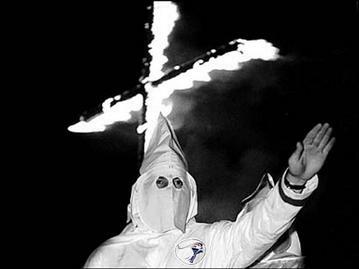 A white terrorist doing the Ku Klux Klan salute. Today, the African American community still suffers not only the brunt of the legacies of White Terrorism from centuries of Slavery, Lynching, Segregation and Jim Crow, but are plagued with another equally brutal regime that has waged a war on them for more than half a century – Mass Incarceration in the name of a war on drugs. Throughout, the Christian church during much of Slavery was complicit in White Terrorism as many Republicans today have accused the Muslim church to be in the face of Jihadist terror. There is cold comfort in knowing that the scale of Islamic terror dwarfs the numbers of lynchings by White Terrorists in the so-called free America to-date. And yet, the so-called Christian, or the white people who claim they are not racist in this country have remained largely silent or even complicit. It is no surprise when over 70 percent of whites in Gallup polls believed that Michael Brown, who was shot and killed in his own neighborhood for absolutely no law enforcement reason, deserved to die. It is no surprise that more than 80 percent of whites in America believed that justice was served when the police officer who choked Eric Garner to death on camera deserved to be let off to walk without consequences. It is still no surprise that the majority of white people today are never swayed in a direction of a common humanity with African Americans when Blacks are victims of crimes. This is America and Blacks are correct to feel they are plagued at every turn with a terrorism that is never talked about in the media nor taken into consideration in law enforcement – White Terrorism. There are Americans who pretend to have no knowledge of the reign of terror that holds Black Americans in its grip, a terror that has held them for nearly three centuries during Slavery and still way after the Civil War. The policemen who disrespected Mayor De Blasio in New York City should be required to have a daily breakfast with lynching postcards from America’s immediate past. And it is childish petulance to criticize President Obama for mentioning Christian terrorism at The National Prayer Breakfast as an American reality as well. He leavened his condemnation of the Islamic State’s recent atrocities with a word of caution to our fellow Christians here in America who wish to conflate the militant group’s actions with the faith of Islam as a whole. Lest we get on our high horse and think this is unique to some other place, remember that during the Crusades and the Inquisition, people committed terrible deeds in the name of Christ. In our home country, slavery and Jim Crow all too often were justified in the name of Christ. The comments prompted vituperation – bordering on apoplexy – from many on the ‘right’ side of American politics. Washington Post columnist Charles Krauthammer called the president’s comments “banal and offensive” and “adolescent stuff”. But who is the adolescent? And who is barbarous? More recent, in North Carolina, three young Muslims who were active in charity work were murdered, by a white man who identified as atheist and expressed hostility to Islam and other faiths. The media refused to cover it until there was outcry from the Muslim community here in America. In addition, it should not take a police investigation to comprehend that the killing of three Muslims was a hate crime, since similar conclusions have been drawn whenever they have involved white victims. The problem with tackling issues like White Terrorism in America is that whites are still the overwhelming majority and the media is so good at swinging that public discourse in whatever direction they see fit. Perhaps to avoid the wrath of a significant number of outwardly racist whites who would incite the overpowering majority to further harass African American lives. But there is no excuse to not call a spade, a spade! There is a plague of White Terrorism in the United States of America’s reflection and imagination of itself that cannot be overemphasized. It’s difficult – almost impossible – to believe that President Barack Obama and his staff didn’t anticipate the white American reaction his words at the Breakfast Prayer meeting would generate. The question, then, is why he picked this particular fight. The president could just be poking the right-wing bear, says the Christian Science Monitor’s Peter Grier. More likely, he continues, he’s trying to counter two views – held by Rush Limbaugh and others – that there is no racism in America and that the US is at war with Islam as a whole. Instead, Grier says, the president – like George W Bush before him – wants to frame the Islamic debate in terms of a fight against “individuals who use distorted versions of faith as a weapon”. Historical Archive: Black men lynched by white terrorists with many white people in attendance. Similarly, the president framed isolating and addressing White Terrorism in America as a conflict in terms of a fight ‘against individuals who use distorted versions of humanity – white supremacy – as a weapon to terrorize, kill, murder and harass innocent citizens,’ vis-a-vis the white public in general, who may not necessarily agree with those views but nonetheless benefit from the white privilege that stems from the actions of white terrorists. Juliet Eilperin of the Washington Post points out that the president’s speech is in keeping with Mr. Obama’s penchant for challenging what he sees as the US public’s lack of self-reflection when it comes to their past sins and their place in the world. Chauncey DeVega, posting on the Daily Kos, goes even farther, drawing a direct comparison between IS’s murder of Jordanian pilot Muadh al Kasasbeh and the gruesome “spectacular lynchings” of the late 19th Century, where more than 4000 official recordings have been discovered spanning a period of only 73 years, which involved hanging, and burning Blacks accused of petty or no crimes. “We cannot overlook how the United States has conducted master classes in violence and barbarism both before, during and since its founding … and yes, much of this violence was against Black people whose labour, lives, land and freedom were stolen to create the American empire,” he writes. Perhaps a rational dialogue about racism and religious extremism throughout the course of history is possible – but it’s increasingly clear that it’s not a conversation this president can start and that this US political environment will tolerate. For example, it has been proven that several episodes of horrific, communitywide violence against African Americans have been erased from civic memory in lynching-belt states like Louisiana, Georgia, Alabama, Florida and Mississippi. But that will change if Bryan Stevenson, a civil rights attorney, succeeds in his mission to build markers and memorials at lynching sites throughout the South as a way of forcing communities and the country to confront an era of white terror directly and recognize the role that it played in shaping the current racial landscape. Mr. Stevenson’s report chronicles over 4,000 official lynchings of Black people in 12 Southern states from 1877 to 1950 and focuses on what it describes as “racial terror lynchings,” and what we call White Terrorism, which were used to enforce Jim Crow laws and racial segregation. Victims in these cases were often murdered without being accused of actual crimes but for minor social transgressions that included talking back to whites or insisting on fairness and basic rights. Why not put up plaques in every American city to note that period of infamy? And what about the documented lynchings in the North? And the race riots of the North and Midwest? And the endemic de facto segregation of the North? Slavery was not the sin of the South alone or the so-called Bible-belt of America, but the sin of the whole American Nation. The ghettoes of the North are a part of that national legacy of White Terrorism just as much. Mr. Stevenson’s report is the result of five years of hard work. Researchers reviewed local newspapers, historical archives and court records; interviewed local historians, survivors and victims’ descendants; and scrutinized contemporaneously published articles in African-American newspapers, which took a closer interest in these matters than the white press. In the end, researchers found at least 700 more lynchings in the 12 states than were previously reported, suggesting that “racial terror lynching” was far more common than was generally believed. The report argues compellingly that the threat of death by lynching was far more influential in shaping present-day racial reality than contemporary white Americans typically understand. It argues that The Great Migration from the South, in which millions of African-Americans moved North and West, was a forced migration in which Black people fled the constant threat of murder at the hands of white mobs. There is no debating that the atrocity of Slavery itself as White Terrorism on Black bodies and lynching are the precursors of modern-day racial bias in the criminal justice system. Mr. Stevenson and his researchers argue, for example, that lynching declined as a mechanism of social control as the Southern states shifted to a capital punishment strategy, in which Blacks began more frequently to be executed after expedited trials. 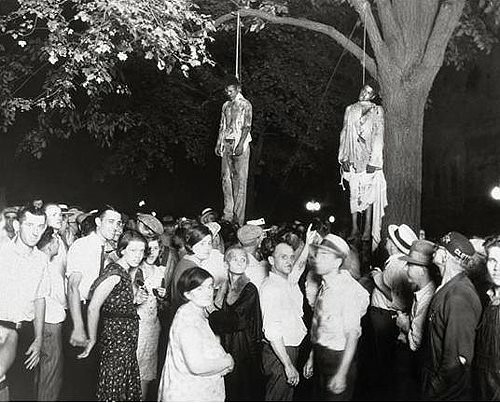 The legacy of lynching was apparent in that public executions were still being used to mollify mobs in the 1930s even after such executions were legally banned. That constant threat to the African American life in the US posed by white mobs is what we call White Terrorism. And it is still alive and well today. Will America recognize the enduring plague of White Terrorism in the American reflection? Throughout history, the American government and its white public have called terrorism by whites different names – Segregation (1849 – 1950), Jim Crow (1877 and the mid-1960s) and more recently a War on Drugs (1971 until present), which by all intents and purposes, renowned lawyers and researchers like Michelle Alexander have rightly called the New Jim Crow – or a war on Blacks. Despite playing a powerful role in shaping American society, the lynching era has practically disappeared from public discourse. Why? Most Southern terror lynching victims were killed on sites that remain unmarked and unrecognized. Meanwhile, the Southern landscape in America is now full of the plaques, statues and monuments that record, celebrate and lionize generations of white American defenders of White Terrorism including public officials and private citizens who perpetrated violent crimes against Black citizens during that era of racial terror. Still the persuasive argument has been made – with the murders of Eric Garner, a Black man who was killed on camera, Michael Brown, Trayvon Martin and Tamir Rice, all of whom were Black children – showing that White Terrorism continues blatantly on even today. Further, several Black people are murdered by America’s white cops every day and yet, the discussion that Black people should be left the responsibility to police their own neighborhoods is not tolerated or even discussed. The FBI director James B. Comey conveniently failed to address that important issue. Alas for what reasoning other than a sustained terror against the Black community? Why can’t African Americans be left the responsibility to police their own neighborhoods? Why? James B. Comey also said that officers — whether they are white or any other race — who are confronted with white men on one side of the street and Black men on the other do not view them the same way. The officers develop a mental shortcut that “becomes almost irresistible and maybe even rational by some lights” because of the number of Black suspects they have arrested. Rational by some lights? What light is James B. Comey hoping to turn off so that white cops can suddenly stop murdering and harassing Black people at every turn? It is difficult – if not all impossible – to understand why African American security men and women dot every corner of white super markets and retail chains around America, but the American society cannot seem to get on board the discussion about making sure that communities are policed and governed by the people who live in it. That the director of the FBI can’t get to speak to this truth about stemming the plague and the every day threat of White Terrorism as the truly American problem in Black neighborhoods, shows that white America is not at all ready to confront its demons. History needs to be properly commemorated and more widely discussed before the United States can fully understand the causes and origins of the racial injustices that White Terrorism of Black lives has brought unto it. White terror, since slavery, still hobbles the country to this day. But the fact that white America refuses to accept the historical underpinnings of white inhumanity to Black America, speaks to a reluctance to look itself in the mirror. Until then, White Terrorism needs to be called what it is. I mince no words in calling it the longest running barbaric event in human history. And counting.